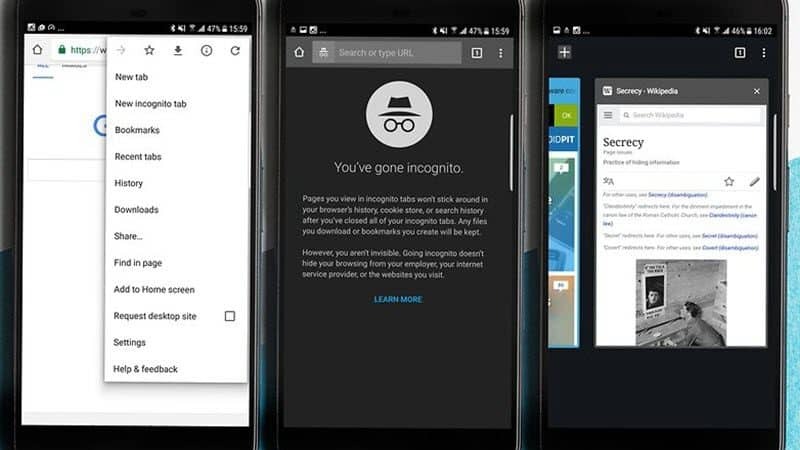 Private browsing on Android has the same benefits as on other platforms: since it hides your browsing activity from other users it’s a great privacy tool in both professional and home environments. Also known as incognito mode, private browsing is a standard feature offered in all popular web browsers, even though the names may vary. If you want to learn how to use private browsing on Android as well as the benefits of this feature, keep reading. Launch Chrome on your Android device,tap the three dots icon in the upper-right corner to access the More menu, and select ‘New incognito tab’. The new tab that opens will allow you to browse the web in incognito mode. It’s also worth mentioning you can have multiple incognito tabs opened at the same time. While there is no specific option to disable incognito mode, you can stop using it by simply closing all the incognito tabs you have open. You can view all open tabs and close them one by one by clicking the square icon on the top right. Alternatively, drag down the notifications bar and tap ‘Close incognito tabs’ to close all of them simultaneously. We recommend you always close your incognito tabs once you’re done using them to prevent others from being able to see and access them. Once they’re closed, all the related browsing history will be deleted. Open Firefox, tap the three dots icon in the upper-right corner and select New Private Tab from the menu. It’s also possible to directly open a link in a private tab. To do that, long press on a link and a context menu will be displayed. Select Open link in Private Tab. You can also view all open private tabs by tapping the tab icon at the top of the screen. Then, tap once more on the mask icon and all the private tabs will be displayed. To close individual private tabs simply tap the X icon next to them. If you want to close all currently open private tabs, tap the menu button and select Close Private Tabs. Even if you’re using your generic default browser, it might have an incognito mode. While the names might vary between phone models and manufacturers, most web browsers do offer this feature. For instance, there’s a Secret mode in the Samsung Internet browser that comes preinstalled on the Samsung Galaxy S10. To use it, tap the Tabs icon, select Turn on Secret and you can optionally set a password. Then, you can start browsing in private mode. You can disable it by returning to the Tabs section where you will need to tap the Turn off Secret option. 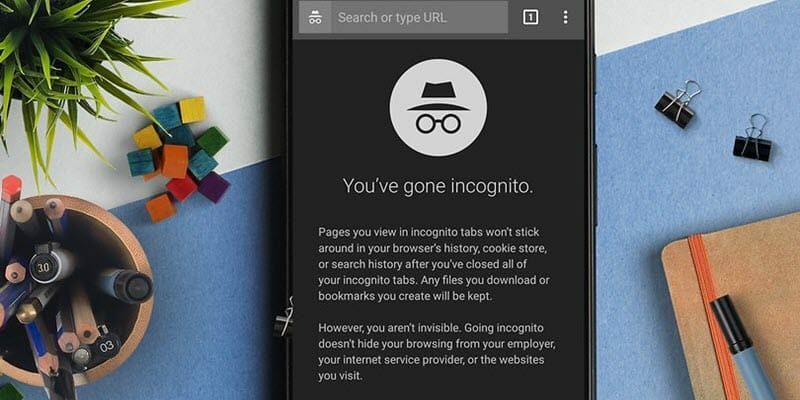 If you’re still wondering if incognito mode is worth using, here are some of the advantages it brings. Private browsing may not block ads but it doesn’t track your search habits so you can get ‘clean’ results and the ad providers won’t be able to use this data either. While in incognito mode, your log-in credentials and form data won’t be saved by your web browser. As a result, private browsing is excellent for keeping this information private, especially if you’re logging into your own accounts from someone else’s device. Incognito mode lets you perform a neat trick. You can use two Google accounts at the same time. One in your regular browser and another in an incognito browser tab. Regardless if you need to search for something personal, business-related or you just want to do some gift shopping for a loved one and keep it a surprise, incognito mode is the perfect tool for this job. Private browsing will not save any of your browsing history or searches as long as you don’t forget to close the private tab(s) once you’re done. Numerous established online publications allow you to read a limited number of posts before hitting a paywall. Nevertheless, you can get around this by simply opening the link in incognito mode which will allow you to access the content. We still recommend you support the websites that bring quality content online but sometimes our budgets are limited and incognito mode makes the perfect temporary solution to keep accessing the content we find valuable. If you need to run debugging software or websites tests, an incognito mode session will ensure a clean user experience and prevent your cache and cookie data from interfering. 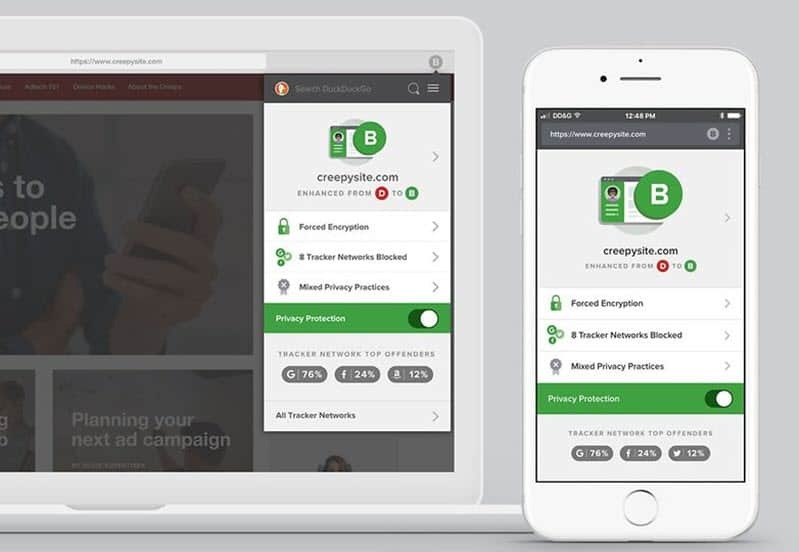 DuckDuckGo is a privacy-focused search engine that’s well-known by now and it’s creators have also developed a web browser. It uses the DuckDuckGo search engine as expected although it also forces websites to use encryption similar to the HTTPS protocol. DuckDuckGo is proudly advertising their browser as one who doesn’t allow websites to track you. They also claim that it ‘decodes privacy policies’. According to the company, they are collaborating with Terms of Service Didn’t Read “to include their scores and labels of website terms of service and privacy policies, where available”. In other words, DuckDuckGo’s browser will display a privacy rating from A to F on most websites you’ll be visiting. On top of that, the browser blocks advertising cookies and tracking, and you can clear all tabs and data at once by tapping the Fire Button. InBrowser is another privacy-focused browser that actually works in incognito mode all the time. This means it never stores browsing history, cookies, and logins past the moment you press Home, Exit, or Close. You have the option of using VPN services, and TOR support is provided via Orbot. With a minimalist design and intuitive interface, InBrowser has most of Chrome and Firefox’s features with the exception of add-on support which is present but not as extensive. 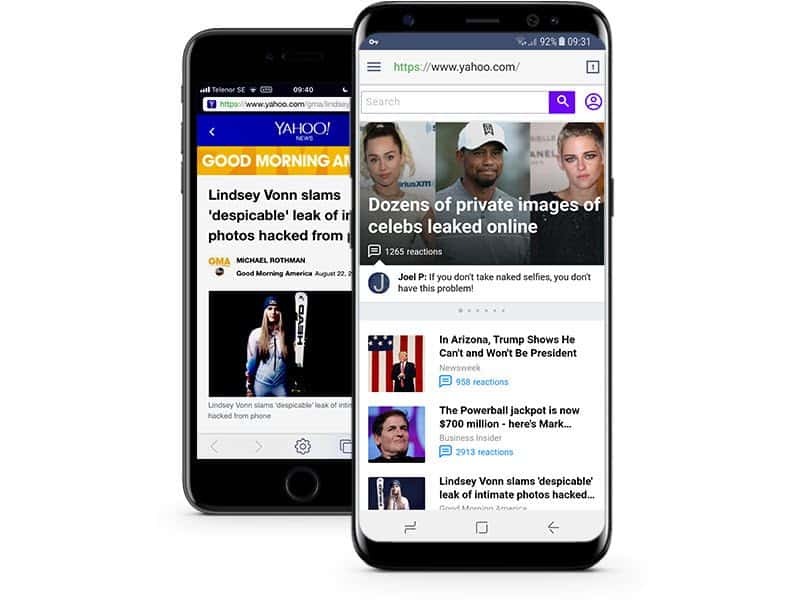 Firefox Focus is also an excellent private-by-default mobile browser designed to block numerous types of web trackers and ads. Erasing your history can be done any moment from the notifications bar and it never stores cookies and passwords. 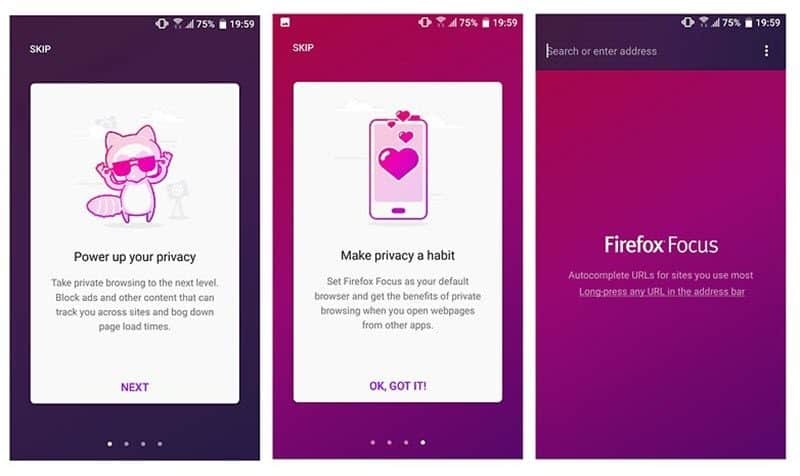 You can think of Firefox Focus as a less burdened and much more private version of it’s more popular sibling, Mozilla Firefox.